Springfield Armory announced yesterday the release of a new pistol. 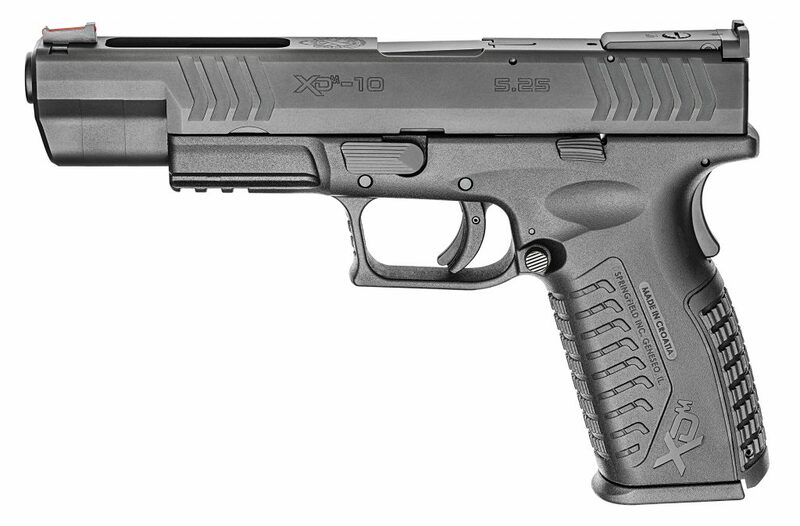 The XD(M) 5.25” 10MM has been added to the line up of pistol calibers available for the very popular XD(M) competition series of pistols. According to the press release from Springfield, an “unprecedented” torture test put 10,000 rounds of Federal Premium Hydra-Shok 10mm ammunition through the stock pistol with 0 stoppages. The test included changing out the recoil spring and lubricating with Lucas Extreme Duty Gun Oil every 2000 rounds. The pistol is available in both 4.5” and 5.25” barrel lengths and boasts an impressive 15 round magazine capacity. This added capacity is attainable because of the full-length grip, which offers more real-estate for shooter’s hands for optimal controllability. Fans of the “best millimeter” will appreciate this after Glock released their G29, a 10mm pistol with a shortened grip making the beast of a gun difficult to handle. The longer grip of this pistol means it won’t make for an ideal size for concealed carry but shouldn’t hamper a shooter carrying the pistol for large animal defense in the great outdoors. The large size should also serve to help reduce felt recoil, while the short reset trigger has a “minimal trigger break” for faster follow up shots. This should help to get back on target more quickly after the hefty recoil of the 10mm cartridge and help increase the shooters accuracy. The only difference between the 4.5” and the 5.25” models, besides the barrel length, is the rear sights. The 4.5” model comes with a “low-profile combat rear sight” while the 5.25” model comes with a “fully adjustable target rear sight.” The front sights for both models are standard for the XD(M) series of pistols with a fiber optic front sight. The rest of the specs are almost identical to what you’d expect to find on other calibers in the XD(M) Competition Series of pistols, with a forged steel slide and barrel, and black polymer frame with interchangeable backstraps. The unloaded weight of the pistol is .8 oz heavier than the .45 caliber model, coming in at 32.8 ounces. The added weight most likely to help the pistol stand up against wear and tear of the more robust caliber 10mm. Also, with SHOT Show clearly on its way in just a few months, we'll be seeing more new releases. As they come to us, we'll keep you updated. Let us know what you think about this new release from Springfield Armory, in the comments below. Check out Springfield Armory’s website for more information.